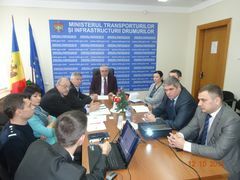 During visit of Mr. Ciopraga to Chisinau, the meeting of related TRACECA experts of the Ministry of Transport and Road Infrastructure of Moldova led by Mr. Andrei Cuculescu, National Secretary in Moldova exchanged views on the TRACECA Road and Maritime Safety projects. Discussion touched the issues on the accession, ratification and implementation of the corresponding EU and UNECE agreements on the international carriage of dangerous goods by road, conventions on Road Traffic and Signs and Signals, agreement concerning the adoption of uniform conditions for periodical technical inspections of wheeled vehicles and the reciprocal recognition of such inspections. Mr. Ciopraga and Moldavian TRACECA experts mentioned the status of developing and implementing technical programmed activities in order to improve and guarantee on a continuous basis road and vehicle safety in accordance with international standards. TRACECA Experts discussed the status of the implementation of the TRACECA Regional Action Strategy (TRAS) on Maritime Security, Safety and Environmental Protection for the period of up to 2021 between the participating states and contribution of the project as well as realization of the main components of the project. A high level of cooperation of projects experts was stated during their various missions to Moldova and meetings with the national authorities. This is one of the necessary conditions to achieve results and advance towards the fulfilment of the objectives of the project, and which will allow the partners and the team to progress in confidence. It should be mentioned that the overall objective of the project are to approximate the partners’ legislations with the EU regulatory framework, support the further ratification and implementation of international maritime safety and security conventions of the International Maritime Organization (IMO) and International Labour Organization (ILO) as well as improving the level of quality and coordination of maritime administrations in the Black Sea and Caspian Sea partner countries. On the outcomes of the meeting participants expressed their hope for the opportunities on the continuation of the EC-TRACECA funded projects in road, maritime and aviation fields.